If we compare the fourth quarter 2007 to fourth quarter 2011 the ratio of Google : Microsoft : Apple went from 1: 3.39:2:16 to 1:1.97: 4.38. 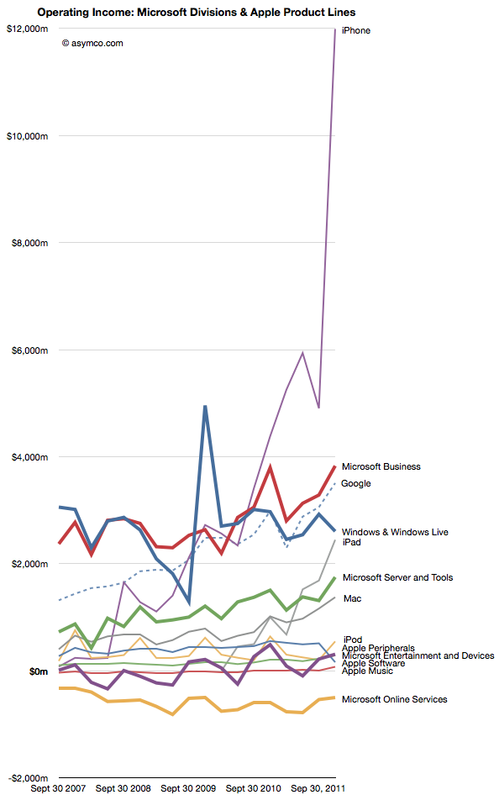 In other words, Microsoft was 3.4 times bigger than Google but today it’s only about twice. Apple was twice and is now about 4.4 times bigger. In terms of operating income (i.e. before R&D, SG&A and OI&E) the ratios were 1:4.48:1.53 and are now 1:2.28:4.82. 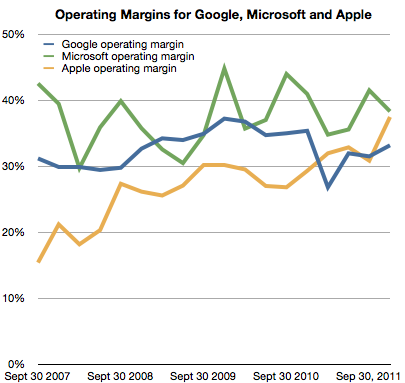 Microsoft’s income gap to Google halved while Apple’s more than tripled. Google and Microsoft have grown but not by adding new sources of revenue. Apple grew its base but, more importantly, added new businesses for spectacularly more growth. 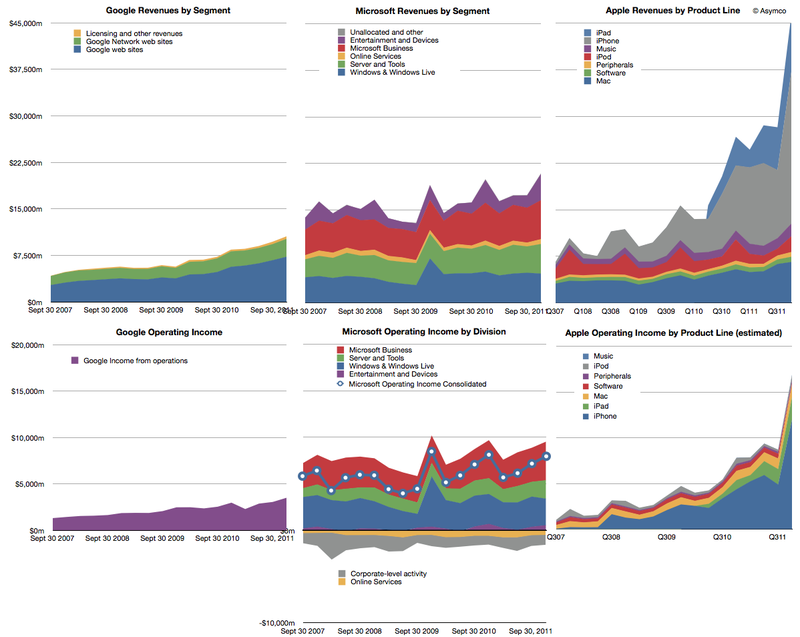 Compared to Microsoft and Apple, Google’s revenue is distinctly single-source: advertising. Though divided between own sites and those of affiliates, advertising is today 96.1% of revenue and was 98.6% four years earlier. Google’s advertising profits have overtaken Windows as has the iPhone and the iPad may do so quite soon. I presented a subset of this material January 30th at a TechMeetups event titled “Apple – world’s biggest startup.” A presentation by Adam Lashinsky focused on the cultural and procedural aspects which highlight Apple’s “startup” nature. My presentation showed, using these graphs, Apple’s growth characterizes it as a “startup”. The growth did not come from a broadening of its core products markets. It came from the creation of new product categories. Google, a much younger company does not exhibit this non-secular growth any more than Microsoft which is about as old as Apple is. 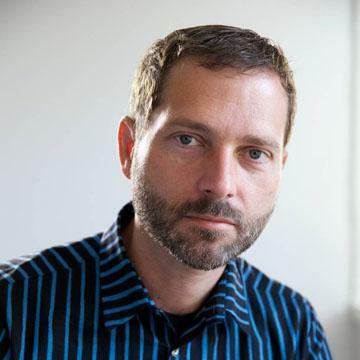 The lesson is perhaps that rapid growth is not the right of small companies alone. Apple has used disruptive innovation to transform itself and offers a stunning contrast to two other companies which are also seen as innovative leaders. › Next Post Tim Cook on the "Law of Large Numbers"